I really enjoyed my time in Columbus this year at the SBC Annual Meeting. Here are six factors that made this the best convention I’ve attended. Last year (2014), I voted for Dennis Kim for SBC president. That wasn’t necessarily anything against Ronnie Floyd—I wanted to see us continue to celebrate our non-white Southern Baptists after electing Fred Luter the two conventions previous. All that to say I didn’t have much of an opinion of Ronnie Floyd one way or the other, positive or negative, before this year’s convention. Alan Cross’ article a few weeks ago alerted me to the fact that Floyd has been working hard toward racially diverse representation on the committee he was responsible for appointing, and possibly also keeping the issue in front of other committees and boards to ensure the issue was made a priority. There was also a constant emphasis on prayer and unity as I heard Ronnie speak in his interview in the SBC This Week podcast about two weeks before the convention. So for me there were positive indications before the annual meeting. Those good signs proved to be only the beginning. Floyd gave a very good convention sermon and conducted the business of the convention well (even when he told me to stop speaking, another post soon on that incident). This convention was probably the most encouraging and enjoyable I’ve been to from a programming/schedule standpoint, and I think that was in large part due to the rearranged schedule Ronnie Floyd worked to put in place. The prayer time on Tuesday night was amazing. More on that below. This year we consolidated similar types of reports and business together in the same session. I was skeptical this would make much of a difference in the actual convention experience. I was wrong about that. The activities of the day seemed to flow and make sense. The continuity was a welcome adjustment. The previously prevalent random “let’s stand up and sing a song now to kill a few minutes” wasn’t missed at all. Judging by the number of people still in the convention hall even at the end of some of the sessions, I’d say the change was a huge success with those attending. I think my only complaint with the schedule was that the seminary report time (all 6 back-to-back) seemed to drag on longer than my attention span was able to stay focused. But then the rather uncomfortable convention center chairs might have been to blame as much as the actual duration. Maybe a 3+3 format with something in the middle to break up the length of the report section, or something similar, could be considered next year. The highlight of the convention schedule was the call to prayer segment on Tuesday night. I’ve heard good messages preached at the convention before, but this was the most powerful, extended worship element I’ve ever seen in the 5 conventions I’ve been to personally (and watched several online in that same time). And I mean by far. No competition. Dave Miller said he remembered a pretty powerful time back in the mid 80’s (about the time I was in kindergarten sorry Dave) when Bellevue organized some banners to march in during a worship time, but that had only lasted a couple minutes. This was an extended time of worship and calling out to God. The time of prayer for racial reconciliation was amazing, as well as powerful times of prayer for the persecuted church and several other areas. Another highlight of the convention, for me, was the Send North America/IMB lunch on Monday. 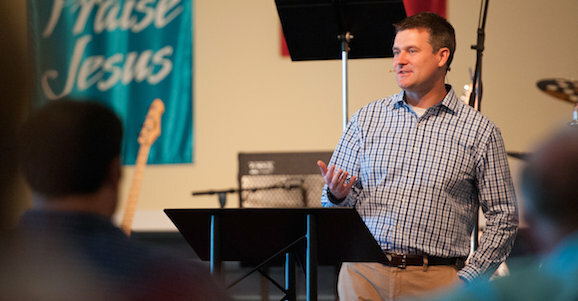 Kevin Ezell and David Platt shared the stage and talked for something like 30-45 minutes. There was good information presented. The contrast between the two, with Ezell’s tendency to crack a joke about every other word, then Platt’s intensity (which he left only briefly to give a courtesy laugh to Kevin’s jokes) was classic. I think more than half the convention showed up for this lunch and I’m glad I wasn’t one of the few who missed it. What would a SBC Annual Meeting be without getting to catch up with friends and meet new ones? I talked to so many people with such obvious love and joy in their lives because of Christ. I sat down at the Southern Lunch with a table full of people, most of whom I had never met, and within minutes we were talking like we had known each other for years and rejoicing in the work God is doing in each others’ lives and ministries. I met some people whose names you’d know from the stage. Each one impressed me (as much as you can tell in a 5 minute conversation or so) as being real and authentic, not walking around with an inflated sense of importance like some might expect. I got to have conversations with Steve Gaines, Clint Pressley, Ronnie Floyd (briefly), and Kevin Smith (if I could name drop a little bit) and thoroughly enjoyed meeting each of them. In the exhibit hall, Steve Gaines called us over to pray with him for a young man who’s going with his family to Alaska to plant a church. It’s little stuff like that where I’m reminded that the pastors whose faces we see on stage and whose voices we’ve heard preach are real men who love God, people, and the work of ministry. They can be easy objects for criticism because of prominent roles (no one’s saying they’re perfect) but I believe each of them, as well as many others I didn’t meet are striving to serve Christ and I want to rejoice that God has blessed their ministries so tremendously. But it’s not mainly the stage personalities that encourage me about our convention. It’s the people I know from blogging & twitter, people I’ve met at previous conventions, people I’ve gone to church with in the past. Hanging out with the SBC Voices guys was awesome. I got to spend a lot of time with Gentry Hill, one of my former youth who’s now graduated from seminary and is now looking for a church to pastor, and who was an absolute lifesaver several times this week. (What a joy to see a former student ready to take on a full time ministry role?! Wow.) I want to go on but this section’s too long already. Too many great people to list and God greatly encouraged me this week through them. The reason we all get together every year is because of the cooperative work we do through our mission boards, seminaries, LifeWay, ERLC, and others. I said it on twitter during the week and I’ll say it again here, we have tremendous leadership in each of these entities and they are doing amazing work— work that deserves to be supported with prayer, CP giving, and our encouragement for these organizations. NAMB and LifeWay are doing the best work they’ve done in years. Our IMB has always done excellent work and Platt is leading them to even greater effectiveness and focus on partnering with local churches. I can’t think of a better spokesman for us on public policy and ethics issues today than Russell Moore and his team at the ERLC. The seminaries continue to do well. And hey, GuideStone has good insurance & retirement too. My first annual meeting was in 2005. Back then there were some bright spots but there were also some things that frustrated me with the state of the SBC. Since that time, my support of the CP has moved from feeling almost obligatory to enthusiastic as I see the direction we’re going and the unity with which we’re traveling there. Attendance has ticked up the past two years, and recent reports showed a slight increase in current year CP giving. Both indicators could mean nothing, but they could also show a slightly renewed interest in our cooperative work as a convention. I pray that’s what we’re seeing because I think it would reward well the hard work that’s been put in to get our convention moving in its current, encouraging direction. Great meeting, Columbus 2015. Maybe St. Louis can be even better. I’ve Heard LifeWay’s Critics and I’m Not Convinced. Here’s Why. Over the past year, there’s been a small but constant stream of criticism in SBC social media about certain books available in LifeWay stores. A few titles and authors are brought up frequently as evidence that LifeWay leadership must not care about sound doctrine or that they care about money more than biblical faithfulness. I reject those characterizations and you should too. Everyone agrees there should be a line drawn determining what books LifeWay should sell. The issue for us today is how tightly that line needs to be drawn to our own views, preferences, and opinions. LifeWay’s critics want Lifeway to function as a theological gatekeeper in a way Southern Baptists have never agreed it should function. Yes, we all agree there are boundary lines. But as someone who considers myself theologically educated and discerning, I am aware that if I personally drew the boundary lines, I would have a tendency to draw them too narrowly and mirroring my own views & preferences. LifeWay’s critics have consistently shown a lack of self-awareness in this area. Here are a number of problematic assumptions and unwarranted jumps in logic that LifeWay’s critics make. These form the foundation of why I reject their conclusions and their methods. LifeWay cannot be seen as endorsing the viewpoint or contents of all the books they sell. Two books advocating different viewpoints may sit beside one another on the same shelf. Which is the endorsed LifeWay position? Sometimes stocking a book might mean nothing more than the work is a prominent example of a viewpoint we would disagree with. Let’s take an egregious example. Should LifeWay sell the Book of Mormon? Initially almost everyone would say no. But what about people who are interested in apologetics and studying other religions? Might there not be a place in a Christian bookstore for books that compare the beliefs of different world religions? Along with that copies of the books or writings of those religions? As far as I know LifeWay doesn’t have such a section and doesn’t sell the Book of Mormon. At the end of the day, I think that’s the best decision. But I hope my example goes to show that a product selection policy might (should be) much more than simply agree/disagree. The fact that I care about sound doctrine does not necessarily mean I only sell books I agree with. Mohler’s theological triage is an important concept here. We have to make decision about what issues are going to be that would cause us to include or exclude certain works. But I think most people who are involved here know that determination shouldn’t be left to the self-appointed theological watchdogs. The people who love patrolling (controlling) what readers have access to are not the ones I want making those kinds of decisions. It’s not clear to me that LifeWay needs to play the role of arbiter on close calls. What about books that fall on the borderline? A critic may list a book as out of bounds but other theologically educated believers might see it as acceptable. I myself have a category for books that I wouldn’t personally recommend but see no problem with having them available for people who want them. The critics seem to have no such category. The critics ever-narrowing set of parameters that may never be satisfied. Those who criticize in this area have shown to be implacable. LifeWay has removed a number of books over the years because of concerns expressed through various avenues. One of the critics’ favorite targets was recently removed. I didn’t see a single one of them express appreciation for the decision. It was a battle won (in their own minds, their criticism actually had little, if anything to do with the book’s removal) and they were on to the next title. Their list is long and I’ve seen nothing to make me think they would ever be satisfied. At least nothing short of letting them go through a LifeWay store and overturn book racks of their own choosing. LifeWay leadership has demonstrated through years of faithful writing & service that they place a high priority on biblical truth & faithfulness. I’m particularly thinking of Thom Rainer and Ed Stetzer here, who often bear the brunt of this kind of criticism. (As if their main role is retail product selection anyway.) Both of these guys have served Southern Baptists well and faithfully for years. They’ve stressed the importance of sound doctrine in each of their ministries. A long list of others at LifeWay should be included here too. The idea that the folks at LifeWay are sitting around board tables in Nashville rubbing their hands together and laughing evil laughs at all the money they can make off selling bad theology would be a laughable caracature if it weren’t asserted so regularly by LifeWay’s critics. It doesn’t make sense. The critics say they’re planning to force LifeWay to address these issues on the floor at this year’s SBC Annual Meeting in Columbus. That’s why I wrote this. Because I have heard them and I disagree—with both the content of their arguments and their strong arm tactics. I’m confident everyone in the convention hall will see through this (threatened) childish tantrum for what it is. Secrecy, revenge, and non-disclosure agreements. Lawyers, threats, and a severance package offered as hush money. It sounds like the drama of a New York Times Best selling novel. But I’m not talking about fictional corporate greed and vengeance. This is life over the last month in the administration at a small Baptist college in Georgia. And this time, the victim is a man who lost his job because he stood up and wouldn’t be part of the charade. released an article called “BPC VP Refuses to Resign, Fired” which shed light on what’s really been happening at Brewton Parker College. The former president, Ergun Caner, resigned last week after a tumultuous one year stay as president of the college. The evidence that’s come to light in the last 24 hours shows that there was a lot more to the story than what the initial press release indicated. Evidently Caner felt he needed help to “restore his credibility.” The SGT article also refers to an incident where 3 witnesses report Caner using inappropriate racial language (it’s unspecified what he was accused of saying). The racial epithet problem is not a new one for Caner, videos of him speaking earlier in his career show him on stage using poorly chosen phrases in failed attempts at humor. There’s no telling what stories are yet to come to light - but I’m told there are more. Caner came in surrounded in controversy. Instead of building bridges and earning trust, it sounds like he did the opposite. But according to the PR department of BPC, everything was going great. For all I know, that’s still the story we’d all be believing if someone hadn’t stood up to the charade. Enter C. B. Scott, Vice President of Alumni, Advancement, and Church Relations at Brewton Parker College. With Scott refusing personal appeals of Caner to help continue to sweep the problems under the rug, Caner resigned. Caner’s supporters on the board of trustees saw C. B. Scott’s refusal as ultimate betrayal and were determined that he wouldn’t survive at BPC either. Offered an “attractive severance package” if he would sign a non-disclosure agreement, Scott refused to act like there was nothing wrong. He could have looked the other way, taken the money, and reasoned to himself, “It’s all in the past, what difference does it make now anyway?” But thank God for his example — that underhanded dealing and wrongdoing ought not to be passed over for the sake of position, prestige, and money. How much better would we be if there were a C. B. Scott at every Baptist College, entity, and institution? By God’s grace there are, no doubt, people with this kind of spine at many of them. And also by God’s grace there are many of these organizations who act with integrity without threat of their inner dealings being exposed — they have nothing to fear or hide. But we know better than to think this kind of stuff doesn’t happen just because these are supposed to be Baptist and Christian organizations. Colleges in Louisiana and now Georgia have garnered national attention because they’ve been run like a good ‘ole boys club rather than with humility and transparency. There’s no doubt there are others who haven’t received this kind of attention or have not yet come to light. If every institution had at least one high-ranking person who said, “I don’t sign NDAs and I don’t sweep wrongdoing under the rug,” the lure of favors, power, and prestige at any cost might suddenly fade. Light makes darkness run. And the risk of being exposed would be too great to act without integrity. Is it too much to ask — that our brothers and sisters who have the privilege and responsibility of leading these organizations, funded by people who offer their trust along with their money, would act accord to the trust given them? The trustees of Brewton Parker College ought to hang their heads in shame. At least the ones who saw to it that C. B. Scott would no longer be employed there as an act of retribution. Also the ones who allowed it without doing everything they could to stop it. Here was the answer to many of the problems in Southern Baptist culture… and you fired him. Last week we learned about an unspeakably heartbreaking tragedy. Tuesday night reports began circulating that Ergun Caner’s 15 year old son, Braxton, was dead as a result of suicide. Countless people expressed sympathy and prayers over social media. Even though we know prayer is the best thing we can do when a tragedy of this magnitude occurs, it feels woefully inadequate. I don’t know anyone in the Caner family personally, but I felt physically sick for the night and next day, and still do if I let my mind linger over the sadness brought by this tragic loss for the Caner family and Braxton’s friends. The reason I write today is because of the layers of public controversy piled on top a situation that is already highly emotional charged (for the record, heightened emotions are perfectly appropriate right now). About a month ago, a vocal pastor named J. D. Hall, criticized photos and comments Braxton had posted to his Twitter feed. Let me try and give a brief summary and background. J. D. Hall has had an ongoing, if pretty one-sided, public feud with Ergun Caner. Caner rarely-to-never responds to Hall and his cohorts, but Hall and others regularly blog, tweet, and podcast about Caner’s past. Out of sensitivity to Caner and his family during this time, getting into the details about what the criticisms are about is neither necessary nor appropriate. They’re well documented online for anyone who wants to find out. And I’ll say that I have been critical of Caner in the past as well, though I’d like to think my criticism has been more measured, reasonable, occasional, and stayed away from making things personal. So Hall has been a frequent and strong critic of Caner, but Caner refuses to respond, and I think that makes Hall and his followers more annoyed and angry. Hall then pushes harder and the attacks become more and more petty and personal as time goes on. I don't think Ergun Caner could brush his teeth in a way that J. D. Hall wouldn't criticize. There’s a lot more to the backstory, but I just don’t have time to cover it and that’s not my purpose today. I hope that will suffice as context for Hall’s comments about and to Braxton Caner on Twitter. His comments were quickly condemned by a number of people online. Here's one example. In fact, that tweet is what alerted me to the exchange. Even though, as I’ve said before, I’ve been a critic of Caner in the past, I recognized Hall’s actions were way out of line. I’ve also previously and publicly criticized Hall (here and here for examples). I believe that public statements and actions are rightfully publicly condemned so I also criticized Hall for his actions. Then I criticized even further when it became clear that he was responding by doubling down on his actions, despite a number of people publicly and some privately telling him he needed to apologize and repent. After a couple days, Hall did finally admit, in a revision to a blog post about the situation, that it was poor judgment to include Braxton in his crusade against Ergun. (Note: that original post and the apology revision have since been taken down at Hall’s blog. I’m assuming his reasoning for taking it down was an attempt to be sensitive to the Caner family since the original part of the post contained material critical of Braxton.) Considering Hall’s earlier attempts to justify his actions and the laughable efforts at some of his followers to argue there was nothing wrong with J. D.’s actions, his apology was a welcome step, though nothing could make up for the complete lack of discernment Hall showed in the first place. I want to make clear that I am not excusing or minimizing the fact that J. D. Hall's actions were immature and reprehensible. In fact, I was one of those who called him out publicly at the time of the event. I was vocal enough in my criticism that Hall blocked me on Twitter. I’ll admit that when I heard about Braxton’s death, the second thought, after sympathy for his family, was the Twitter exchange that occurred a little less than a month earlier. Could that have been a cause or contributing factor in this horrible situation? And if so, how much might it have affected the young man? Now, to be fair, I didn’t know anything about Braxton—at all—except for this online exchange a month before. Where else could my mind have gone? And I think a lot of people in my situation (online observer) likely had those same kinds of questions for the same reason. In the days since the news spread, I’ve seen people condemn Hall as if he is the sole and lone cause of the young man’s tragic decision. I've seen long blog posts documenting every word written and spoken by Hall about the situation, seeming to tie his actions in a causal sense to Braxton's death. Then, on the other side, I’ve also seen defenders of Hall ask things like, “are you saying J. D. is to blame?” insinuating that there’s no blame whatsoever to be assigned to Hall—as if to assert that his actions were a contributing factor defies logic and is nothing more than an emotional reaction. Neither reaction is right nor helpful to anyone. One thing we know is that we don’t know—especially those of us viewing this situation from a distance. It seems virtually impossible that this one event, 27 days before his death, could have single-handedly caused something so tragic. On the other hand, I don't believe it had no effect on Braxton. For a young man, one who could have been struggling in other areas of life, to be the victim of what he considered an attack on himself and his family very well could have weighed more heavily on him than it would have on many of us. It may have weighed heavily on him, or he may have brushed it off quickly and thought no more of it days or weeks later. Once again, those of us observing from a distance just don't know. Maybe Braxton’s family and closest friends have some insight into what was going on in his life and mind. Maybe they have reason to believe Hall’s actions had a great impact or relatively no impact on him. If that’s something they ever want to talk about publicly, I’m willing to listen carefully and learn. From what I know of those who have dealt with suicide closely, often those closest to the deceased can only speculate—so it may be that no one ever knows how much, if any, blame deserves to be laid at the feet of J. D. Hall. It’s completely reasonable to posit Hall’s comments could have been one more cloud on an already dreary day for this young man. In this scenario, Hall’s actions would be properly considered a contributing factor, though I think it would be nearly impossible to determine how great of a factor. It's also completely reasonable to imagine that Braxton laughed off Hall's actions as "some weird guy from Montana who stalks my dad tried to bother me on Twitter." Braxton did poke back at Hall as being "creepy" and strangely obsessed. The fact is that we don't know. We don't know if Hall's actions were a considerable factor, a minor factor, or no factor at all. The fact that we don’t know should make all of us—Hall’s critics, his defenders, and the rest of us—very cautious about the way we speak, either accusing or defending. The one thing we do know is that Braxton’s death is a terrible tragedy and we ought to continue praying for all those personally affected by his death. As for the rest of it, let us be slow to speak and ready to listen. Note on comments: Due to the nature of this topic, I've temporarily changed the comments policy site-wide to require moderator approval before any comment appears. I welcome productive conversation, but am afraid of the direction comments could go on this subject. The line between what's allowed and what's not will be completely subjective and up to my judgment. Personal attacks directed toward anyone will be off limits. Feel free to contact me on Twitter as well. I may selectively reply to concerns there. I'm very thankful that the Baptist State Convention of North Carolina voted to hear and then voted to pass the pro-Great Commission Resurgence resolution I offered from the floor of the convention. If it had not been for that vote, I'm not aware of any official action that we would have been able to point to and say that North Carolina is on board with this vision. After such a historic moment in June at the SBC, I think it was huge that we had something positive come out of our state convention. 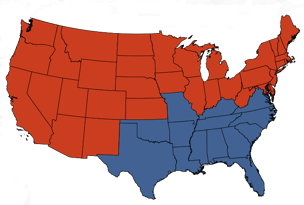 Several states voted to move to a 50/50 split in Cooperative Program funding—with half staying with the state convention and half being forwarded directly to the national level Cooperative Program: Florida (within 4-7 years), Kentucky (by 2017, with bulk of change in 2011), and Tennessee (by 2012-13) That is a major step and I am actually shocked (but glad!) they took that kind of action so quickly. It should be an indication to other state conventions that it is possible if made a priority. A huge thank you to all those in these three state that worked to see that happen. Next week is the Annual Meeting of the Baptist State Convention of North Carolina. Part of that meeting each year is a time for the messengers to vote on resolutions expressing the sentiment of the convention. This year, I submitted a resolution about the GCR Task Force for consideration, but the committee declined to present it during the meeting. I haven't yet decided whether to try and introduce the resolution from the floor. Here's the text of the resolution. If you have feedback, I'd be glad to hear it. That may help me make a decision about trying to introduce it during the meeting itself. RESOLVED, That we are grateful for the approval of the Task Force report in June and hope for greater Great Commission effectiveness as a result. The committee's reasoning for declining the resolution for consideration? It (1) "did not seem appropriate" to "single out a particular committee for affirmation" and because (2) it was "directive in nature, calling on the Convention to take action". At this point, I might point out one resolution that was accepted here. You might also note that it singles out a particular BSCNC employee for affirmation (paragraph 7) and calls the BCSNC to specific action, selecting leaders who have demonstrated support for the Cooperative Program (paragraph 6). You can judge for yourself whether these are legitimate reasons for declining to consider the resolution. EDIT (con't): After receiving some feedback on the resolution, I've decided to make a few changes as noted above. The biggest change is from "affirming" to "appreciating" the work and recommendations in order to make it sound less like an official endorsement. After making that change, I added the last sentence to make the resolution a little more clear that we are also thankful for the content of the report and its adoption. I've also decided to go ahead and try to present the resolution to the BSCNC annual meeting next week. I'll do that by making a motion during the miscellaneous business session on Tuesday morning. It requires a 2/3 majority on a motion to "Suspend the Rules" so that we can consider the resolution. It's likely a long shot to even get it heard, but I sincerely want something to come out of our state convention this year expressing support for the GCR movement and vision. The Southern Baptist Convention just adopted, by a fairly wide margin, the recommendations of the Great Commission Resurgence (GCR) task force. You can look back at my previous posts for summaries about that seven recommendations that made up much of the report. There were also some challenges to individual Christians, churches, state conventions, and others that make of the remainder of the report. I am relieved and joyful that this report was adopted by the convention. From my perspective, this was a strong statement by the majority of Southern Baptists present that our convention is defined by more than simply a giving formula. The adoption of the report means that not only do we share the Cooperative Program (CP) as a means of funding various ministries, but we are also together because of a common mission. This week the convention clearly stated that the CP is not preeminent. The CP exists to serve our common mission. This importance of this cannot be understated. It opens up the CP to a whole new level of evaluation and scrutiny - which the GCR task force used over this past year to recommend some pretty important changes for the sake of its own effectiveness. As David Platt said at the Nine Marks gathering Tuesday night, passing the GCR was a good step forward; not passing it would have been a very big step backwards. We leave the Orlando 2010 annual meeting of the SBC better situated for a future of missional engagement, at home and across the world. Now it's up to us to make sure Orlando was not the end, but only one more step along the way of a true Great Commission renewal movement in evangelical and specifically SBC life. Components 5, 6, and 7 in the final report remain substantially the same as their corresponding recommendations from the progress report. For these three, I'll summarize briefly and point you back to my post on each of those components from earlier. This component recommends removing the limitation currently placed on the IMB and its personnel. So as not to step on NAMB's toes, they are not allowed to work in North America (U.S. and Canada). In initially it makes sense, but the problem comes when you consider the vast populations of internationals living here with cultural and language barriers that NAMB is not prepared to cross. This frees the IMB in situations where it would be beneficial, to work with groups like these. For more on this component, see my earlier post, The IMB Without Limits. This recommendation places the leadership for promotion of the Cooperative Program (CP) and stewardship primarily with the state conventions and away from the SBC Executive Committee. For more in this component, see my earlier post, Stemming the Tide of Duplication. The task force wants to see us break the "50 percent barrier". This component redirects 1% of the national CP budget away from the Executive Committee and to international missions. A one percent shift represents around 2 million dollars. For more on this component, see my earlier post, Breaking the 50% Barrier. The fourth component of the GCR task force's final report deals with the work of the North American Mission Board (NAMB). It calls for NAMB to be refocused and reinvented for better Great Commission effectiveness. The goal and thrust of this component is much the same as it was in the progress report, which you can read more about in my earlier post, Reinventing NAMB. In this post, I'd like to list some of the specifics of the final report. 2. Cities and Underserved Regions as the Target - Two thirds of our Cooperative Program dollars in North America are spent in Southern States, where Southern Baptist presence is already strong. The task force wants to see our resources going to places in the U.S. and Canada where there is a limited number of churches and little gospel witness. 3. Missional Strategy as the Means - To some, the ideal church plant would be a remake of First Baptist, Some City, Alabama, merely relocated to New York or Michigan, or Oregon. Thankfully, the task force has called us to look at all of our settings as mission fields, which means the churches we plant will be designed to effectively reach and communicate to the populations in their respective communities. This may even include (gasp!) planting churches without 'Baptist' in the name. The point is reaching people with the gospel, not preserving SBC culture and tradition. In fact, in many (most) contexts, Southern Baptist culture gets in the way of helping people to hear the message of salvation by grace through faith alone. 4. Phasing Out Cooperative Agreements - In place since the 1950's, this is the method through which NAMB has partnered with state conventions. The way it currently works, too much is sent back to areas where Southern Baptist presence is already thick. Instead of phasing them out over a 4-year period, as the progress report recommended, the time period has been extended to a 7-year time frame. Also an addition since the progress report, they've called for a strategy to replace this method that will better reflect NAMB's new priorities and areas of emphasis. 5. Leadership Development - The task force is calling on NAMB to take the central role in developing pastoral leadership with particular attention to contextual evangelism and church planting. This is one area of the report where I'm not personally convinced it's the best idea. It may be appropriate for NAMB to take on this responsibility as long as it remains a small, small part of what they do. The fact that it's geared to equip pastors in contextualization and church planting makes it better. To me, it seems to fall in the not-quite-essential category. I think there are plenty of leadership development opportunities available from various groups and ministries. I'd rather see NAMB point pastor and church leaders to those already available resources than trying to do what's already being done. 6. Decentralization - The progress report mentioned NAMB from seven regional offices rather than one single national office. The final report does mention decentralization (11) but doesn't include specifics of what that decentralization looks like. Of course the decision will be up to NAMB leadership and trustees, but I suppose we have to look back at the progress report for the clearest idea of what the task force has in mind. Even with some slight reservations as mentioned above, I believe it is essential that the SBC messengers adopt component 4 in Orlando. We cannot continue to operate as we have in the past. NAMB has lacked effectiveness and doesn't inspire confidence among too many Southern Baptists. This is an opportunity to mark a new chapter in the existence of the North American Mission Board. This component of the report is mostly the same as it was back in the progress report, so I will point you back to my post at that time: The CP Loses Its Monopoly. I think the essence of the component has stayed the same and I stand by my comments there. In this post, I want to briefly state why I support this component. I'll also cover a few tweaks in the final report that I think are worth noting. I support the move to Great Commission Giving because churches should have the right, without others criticizing or sneering at them, to bypass the inefficient state convention system with their missions giving. I maintain that it is irresponsible for churches in states where 2/3 of missions funds are kept in-state to make the Cooperative Program their exclusive means of supporting missions. When churches decide to take ownership of their missions giving, still supporting SBC causes, they should be celebrated and not stigmatized. I am thankful for churches who have decided to give directly to the national level Cooperative Program so that a higher percentage of funds gets to ministries that they (and I) consider priorities. Great Commission Giving affirms these churches and makes the Southern Baptist Convention a place that is welcoming. Welcoming to those of us who will not toe the line to let state convention executives divvy out funds as they see fit. That, in short form, is why I support the Great Commission Giving Recommendation. There is a call for Southern Baptists to give sacrificially "as never before." This stems from research showing abysmal giving statistics for average church members. If more of our church members practiced biblical stewardship (note I didn't say tithing), a floodgate of resources would be opened for our cooperative missions work. One aspect about which I've heard very little mention is the call to include estate planning and planned gifts (9) to undergird Great Commission work after we've departed this life. I like this inclusion and it's something we should think and hear more about. The task force also calls us "to support the Cooperative Program as never before." It may seem counterintuitive to what I've said above, but I believe that the attitude change signified by the adoption of Great Commission Giving will make me and others more willing to support the Cooperative Program; because we feel a resonance once again with the direction of the SBC, and because state conventions will receive the message that more needs to be forwarded to the national level. I really believe that, over the long term, this proposal will help increase the funding going to Great Commission missions work and the Cooperative Program itself. I think this component is even more important than I realized at first. There is an argument that appeals to logic for being a part of the SBC. It has to do with the great job our IMB does with reaching the nations; the great job our seminaries do with providing a high-level education at a relatively low cost; the ways many of our other ministries succeed in doing effective Great Commission work. This is a practical argument and I think in many ways it is effective to those who will listen. But many (and more all the time) refuse to listen to that argument because they cannot get past SBC culture. In order for someone to partner with the SBC for ministry, they must first feel an affinity toward the SBC. They must feel drawn to this fellowship of churches. And if we're being honest, our culture is more likely to drive away than to attract. Until we own up to this reality we can't fix the problem. Until our culture looks more like these values, the exodus of young leaders will continue, regardless of how effective we make our giving program. A new culture is essential to turning the tide in the SBC. The GCR task force has done us a service by placing this reminder in their report. The Southern Baptist Convention does not currently have a recognized mission statement. When the progress report was released, the call was made for us to rally around a "clear and compelling missional vision." I think everyone agrees it would be good to rally around such a vision - but what exactly would that vision be? I didn't see this coming but I think it is a good addition to the progress report. It's concise, simple, and should be easy to memorize for anyone so inclined. There's a lot packed into the one sentence. "A convention of churches" recalls the centrality of the local churches of our convention - it is not the convention's role to fulfill the Great Commission, but to assist churches in fulfilling it. "Our missional vision" calls attention to the need for us all to see our own contexts as mission fields. "To present the Gospel of Jesus Christ to every person in the world" encompasses both missional living at home as well as pioneer North American missions and the farthest reaches of international missions. "To make disciples" calls us to remember the priority of discipleship, not stopping at conversion, but the need for growing and maturing believers. "Of all nations" points to the heart of Southern Baptists in making the gospel known among all peoples of the earth. This is actually a split of Component #1 in the progress report. So what was Component #1 in the earlier series of posts has now become components 1 and 2, and therefore rearranges the entire numbering system from all my previous posts. In other words, they made it all complicated for me trying to write these blog posts! But in all seriousness, I think they were right to separate the vision statement from the core values. I'm happy with the statement as it's presented. Could it be improved in some ways? There's no doubt many will think they should have said it a little differently here or included something there. But I think it's a good statement and worthy of our support. I hope it will help us channel our energy and resources even more as we're reminded of our priorities. A little less than a week ago, the GCR Task Force released their final report. The report is available in video format and in a full text version (available in either html or as a .pdf file). As I go through the report, I'll mention pages numbers as shown in the .pdf file, so if you want to see the sections I'm describing, you can download this file to follow along. Pages 2-6 of the report gives an introduction to the report and a summary of why many think a Great Commission Resurgence is needed. It begins with a call to reclaim our identity for a new generation. The GCR Motion from the 2009 meeting in Louisville is reviewed along with a few words about the work of the task force (pg. 2). "A Great Commission Resurgence grows directly out of a Great Commission theology." (pg. 4) A breath of fresh air! We often hear calls to cooperate in spite of theology; but there is the one way that gives us a true foundation for lasting fellowship and cooperation: a common theology. We are united in believing that Jesus is the only way to be delivered from God's wrath and that all those who don't believe in him stand condemned. We are united in believing that unreached people must hear the gospel in order to be saved. We are united in believing our mission is to take this gospel to the ends of the earth and to everyone on this planet we are capable to reaching. The report calls us to rally around this biblical understanding of reality and our purpose here. For a Great Commission Resurgence, theology is not to be abandoned or ignored, but becomes a new and more solid foundation for cooperation and mission. Along with the gospel as our theological center, we also agree that the local church has "primacy and centrality." "The New Testament identifies the church as the central instrument of the kingdom of God." (5) The task force rightly sees the Great Commission as something churches must own themselves and stop thinking of the convention as the place where we outsource the work. Because the local church is central, the task force issues a call for churches to rally around "a new missional vision." (See "Missional Described" for further explanation.) "Each individual congregation must accept the responsibility to reach their village, community, town, or city with the good news of Jesus Christ." (6) So our churches must begin to view their own setting as a mission field and all Christians as missionaries. All of our Baptist work beyond the local church must exist solely to serve the local church in this mission. This is true for every Baptist association, state convention, and the Southern Baptist Convention. None of these exists for itself – all exist for the churches. Every pastor must be a missionary strategist, and every church must be a missionary sending center. Every congregation exists to replicate itself and to plant other Gospel churches. Every entity of Baptist work must exist to serve our churches in this missional vision. After walking through the introduction, it's hard for me to understand the criticism that the report is heavy on structural changes but light on recognition of the need for spiritual renewal. The task force has clearly set the stage - a theological center and missional vision that provide for both spiritual and structural renewal. Look for the new series on the final report over the next week or two. Yesterday morning, the Great Commission Resurgence Task Force released their final report in preparation for the SBC Annual Meeting in Orlando next month. I am excited about the report and want to go through it in some detail soon. But for now, I'll provide some information and resources. 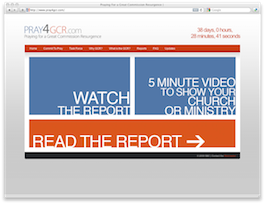 The report and videos may be viewed at the Great Commission Resurgence website, http://www.pray4gcr.com/. You can read the report or watch a video where Ronnie Floyd presents the report. They've posted an additional short video to be shown in churches about the GCRTF's work. You can see it below. A Great Commission Resurgence from GCR on Vimeo. The Biblical Recorder printed a Baptist Press news release that is a good summary of the report. It may be the quickest way for you to get an overview of the report. 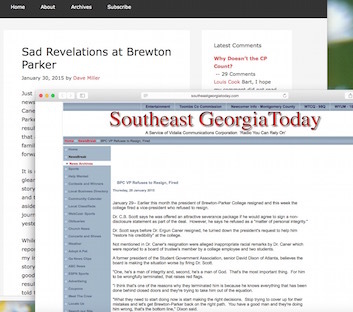 I also wanted to point you to a post at Southeastern Seminary's all-star blog, Between the Times, written by Steve McKinion. Steve makes the case that the Great Commission Resurgence movement is the direct descendant of the Conservative Resurgence movement of the last few decades. For a positive assessment , see “Penetrating the Lostness”: One Enthusiastic “AYE” for the GCR Report! at SBCImpact. For a predictably negative negative view on it, see My Take on the Final GCR Report at Les Puryears' blog. I'll probably interact in detail with Les' criticisms in an upcoming post because they seem representative of most people who dislike the report. I link to it here so you can stay well-informed. On the eve of the Great Commission Resurgence Task Force's final report, here are some of my thoughts on the last section of the progress report. 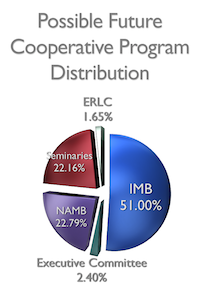 In the current system, half of the funds that reach the national level of the cooperative program go to the International Mission Board. This rightly reflects that our primary reason for cooperating together as a convention is for the purpose of getting the gospel to the ends of the earth. In order to show an even greater emphasis on international missions, the GCR task force has recommended that this percentage be increased from 50% to 51%. We believe in order for us to work together more faithfully and effectively towards the fulfillment of the Great Commission, that a greater percentage of total Cooperative Program funds should be directed to the work of the International Mission Board. Therefore, we will ask Southern Baptists to support this goal by affirming an intention to raise the International Mission Board allocation for the 2011-2012 budget year to 51%, a move that is both symbolic and substantial. At the same time, we will ask Southern Baptists to reduce the percentage allocated to Facilitating Ministries by 1% as part of our initial effort to send a greater percentage of total Southern Baptist Convention mission funds to the nations. Note the language that says this increase will be both "symbolic and substantial." They say it will be substantial because, though one percent doesn't sound like much, when we're talking about a budget of just over 204 million dollars, it does mean a lot of money. To be specific, we're talking about just over two million dollars going to the IMB from this change alone. That is a substantial increase, even for an organization with a budget of over 317 million when the IMB is being forced to suspend some programs and hold trained missionaries off the field because the money is not there to send them. In my opinion even more important than the substance of the increase is the symbolism of the fact that, as the report states, "for the first time, in our history, more than one-half of all monies that come from our churches through the SBC cooperative program will go to the reaching of the nations." In recent years, when percentages have been altered, the IMB was left out of those entities receiving an increase. It seemed like they had reached the magic number, the invisible ceiling of 50% and they would never see an increase in that number. So I am very thankful that the task force is recommending we do away with this limit. In future years, as giving begins to increase again, I hope it will climb even further (growing at a slightly faster rate than other entities). Or, in case of a continued decline, I also hope the numbers can be adjusted so that the decline is absorbed in other areas rather than international missions. Where Does This 1% Come From? If the IMB portion is increased by one percent, that percentage point must be cut somewhere else: Facilitating ministries, according to the report. That means the Executive Committee. Luckily, part of component #4 was eliminating CP promotion and stewardship education from the role of the Executive Committee. That reduction of responsibilities paves the way for the IMB increase. You can imagine those in and close to the Executive Committee haven't been too pleased with what will amount to a significant reduction in their budget. In fact, some have claimed this change will "gut" the work of the Executive Committee. Do you hear that sound? It's the sound of millions of Southern Baptists weeping because the work of the Executive Committee is so near and dear to their hearts. They just can't bear to see it "gutted." Now that you've stopped laughing, it shouldn't take you long to realize that this kind of change is exactly what the GCR Task Force was called to do - make recommendations to get more of our money to actual ministries while spending less on things that aren't necessary. That means some painful cuts in some areas that may be doing good work, but just are not essential to our mission. I'm looking forward to tomorrow's final report. It should be released by 9:30 Eastern time on the website http://www.pray4gcr.com/. Along with Component #2, this section has generated the most controversy. It calls for a new category of missions giving to be reported by SBC churches. 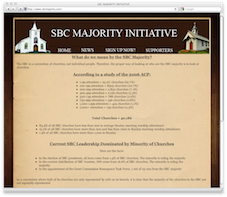 Currently, there's only one way for churches to give officially to the SBC: (1) Send a check to the state convention. (2) Let them keep as much as 2/3 of the money you send. (3) Have about 1/3 (average 36.55%) forwarded on to the national level cooperative program, which is often advertised as the face of the CP. Because of this "overhead" at the state level, many churches have opted to withhold part of their would-be Cooperative Program gift and send it instead directly to ministries they want to see flourish. So a church might send money directly to the IMB, NAMB, or one of the seminaries, or a NAMB-affiliated church plant, but that money doesn't "count" as CP giving. We believe in order for us to work together more faithfully and effectively towards the fulfillment of the Great Commission, we will ask Southern Baptists to reaffirm the Cooperative Program as our central means of supporting Great Commission ministries; but in addition, we will ask Southern Baptists to celebrate with our churches in their Great Commission Giving that goes directly through the Cooperative Program, as well as any designated gifts given to the causes of the Southern Baptist Convention, a state convention or a local association. So instead of the Cooperative Program gifts being the only measure of how much a church "participates" in the SBC, that will become only a part of the measurement - that is, if the GCR task force recommendation is adopted. It will be CP gifts plus any direct giving to SBC causes totaled together for the new category of "Great Commission Giving." Now there are some people who really, really don't like this recommendation. After all, can't we all just get along, cooperate, and let some people in a budget meeting somewhere determine where our missions giving is spent? The reality is that some churches don't feel like they can allow the CP to be their primary way of supporting missions. It's a sad day when churches are giving around the Cooperative Program precisely because of their commitment to the Great Commission. While I do support this recommendation, I think, in actuality, it accomplishes little. Churches who want to give around the CP are going to do it anyway, regardless of whether or not it "counts" on their church profile. There may be a few who see this as an endorsement of other giving methods and decide to pull back CP support, but that number will be small. The reason Component #5 matters is that it shows a acknowledgement by the convention that we are going to respect churches who choose a different giving formula than the one assigned by their respective state conventions. When pastors like Bryant Wright lead their churches to decrease CP giving and forwards that same amount directly to the IMB, is he to be celebrated or chastised? I think that should be celebrated. And so, apparently, does the GCR task force. I was able to make the trip to Southeastern yesterday with a few other pastors from our association. We went for the Baptist21 Great Commission Resurgence Task Force panel. The discussion was a question and answer format (questions being sent in ahead of time) for task force members. Danny Akin, J. D. Greear, and Al Gilbert were there live with Ronnie Floyd joining by live video feed. 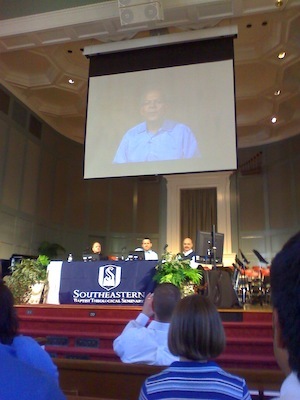 Johnny Hunt joined by pre-recorded video (pictured below), as did Al Mohler. The panel addressed some common concerns that have been raised by the progress report, as well as some statements made by those opposed to the recommendations that have been made. The panel was pretty aggressive in going after what they feel are some misconceptions about their recommendations. They said strongly that their work will not adversely affect work in pioneer states, in fact the whole purpose is to get more resources to areas like that. There's a lot more I'd like to mention. I may go through and give some more detailed descriptions in a later post. Baptist21 has said they'll get the video up on their site as soon as its available. I'd look for it in the next day or two and I'll update this post with a link to it when its available. I really recommend you watch it if this is an issue you're concerned with. In the meantime, check out these two reflections from two people who were also there. Norman Jameson of the North Carolina Biblical Recorder gives a fair and detailed take on the session here. Alvin Reid gives some of his thoughts on revival movements and the role the Great Commission Resurgence and Baptist21 are playing in Southern Baptist life. Duplication of ministry is one of the greatest causes of inefficiency in the Southern Baptist system. It stems from good intentions. Each group wants to have a well-rounded, helpful ministry. Over the years, state conventions, for example, add different ministries but very rarely shed any. There's constant addition. "Hey! We can do THAT too!" seems to be the normal mode of operation. Let me give an example from our state. I hope it won't step on too many toes, but I think its a perfect example of what I mean. Over the last few years, the state WMU has moved out of our state convention offices in order to avoid state convention leaders' influence over the organization. (The state convention was too conservative for the liking of WMU.) Also, issues with appointment of trustees have led Baptist Retirement Homes and the BSCNC to part ways as well. These were two fairly prominent organizations the state convention had been involved with, and now no longer was. So what did they do? See it as an opportunity to shed some layers of organization? Take the opportunity in a time of declining budgets to downsize? From a standpoint of mission and vision, did they see it as a chance to narrow the focus of what the state convention does? None of the above. Instead, the BSCNC started two new ministries so they could continue to be involved in women's ministry and senior ministry. NC Baptist Aging Ministry had a budget, as a new organization, of over $900,000 in 2009 and of $800,000 in 2010. That's right around 2.3% of the entire state convention budget. Now this is not to discredit the work of NCBAM or Embrace. I'm confident they have great people involved and do a good job with their respective ministries. But that is not the point! Maybe we don't have to be involved in every possible ministry. Maybe we could just leave women's ministry to some groups out there who are already doing women's ministry well and simply put our churches in contact with those groups! Maybe it's not the job of a state convention to teach our churches how to have exercise classes for senior adults. Again, there's no doubt a lot of good has been accomplished by both of these groups. And I'm sure the people working with them are wonderful. The real question is: Are these essential to our mission? When we have so many organizations around the country with this same kind of attitude, that means there are a lot of people doing exactly the same job just for a different geographical region or different constituency. Instead of having 2 or 3 things we do really well, we all have the same 10 things that we're working on and our attention and resources are divided. Add to this the fact that it's not just 41 state conventions we're talking about, there's also NAMB, local associations, churches, parachurch organizations... That means that in addition to ministry staff for each of these different ministries in each organization there are also administrative and organizational costs. Overhead increases exponentially. There ends up being a lot of wheel reinventing going on. So the question is, instead of everyone doing all five, why don't we designate one level to be responsible for some of these things? Maybe divide them up 3/2 so that each level can focus more clearly on the tasks it's responsible for. Say church planting and mission trips become the responsibility of NAMB and let state conventions take care of church consulting, stewardship education, and CP promotion. Makes sense and sounds easy, right? Well, I'll be the first to admit that theory is easier than reality here. It's not realistic to make such clean-cut distinctions and divvy out jobs like we're task manager on Celebrity Apprentice. We believe in order for us to work together more faithfully and effectively towards the fulfillment of the Great Commission, we will ask Southern Baptists to move the ministry assignments of Cooperative Program promotion and stewardship education from the Executive Committee of the Southern Baptist Convention and return them to being the work of each state convention since they are located closer to our churches. Our call is for the state conventions to reassume their primary role in the promotion of the Cooperative Program and stewardship education, while asking the Executive Committee of the Southern Baptist Convention to support these efforts with enthusiasm and a convention-wide perspective. So what we're talking about is making clear that the Executive Committee will no longer play a role on stewardship education and Cooperative Program promotion. That job will be left to the state conventions, who are already involved in this area as it is. In my view, this is a fairly modest proposal considering the amount of duplication that exists. The task force could have called for more here and I would have been happy. But as a jump out of the starting block, I'm happy with this proposal. One final note on this item. I came across an interview with Morris Chapman (HT: Les Puryear), head of the SBC Executive Committee yesterday. He said if this proposal is adopted, it "will be the first time since 1927 the convention will fail to use its own money to promote its own ministries." This is nonsense. To decide not to do something, and then to follow through and not do it does not equal failure. It really is beyond me why some people can't see past the way we've always done it. There are other options. The only failure here would be to allow duplication in this area to continue. In what may be the most controversial component of the progress report, the task force is calling for an overhaul of the North American Mission Board. There has probably been more discussion on this component than any other. It's easy to understand why. When the task force remains in the realm of theory, when they're calling Southern Baptists to a change in attitude or to certain core values, pretty much everyone can agree with that. There's no cost. But when change to structure and funding models enters the picture, thats when reality sinks in. The rubber hits the road in Component #2 with some recommendations for remaking NAMB into a more effective organization. We believe in order for us to work together more faithfully and effectively towards the fulfillment of the Great Commission, that our North American Mission Board needs to be reinvented and released. Therefore, in order to do this, we will ask Southern Baptists that the North American Mission Board prioritize efforts to plant churches in North America and to reach our nation’s cities and clarify its role to lead and accomplish efforts to reach North America with the Gospel. The task force is recommending that the restructuring be centered around a strategy for church planting. They call for at least 50% of NAMB's budget to go toward church planting. The church planting should focus on metropolitan areas (especially outside the Southern Baptist South) and underserved people groups (pioneer areas of North America). So a few minor changes should take care of things, right? Absolutely not, and that is one point I think the task force is trying to convey. NAMB is broken, complicated, messy, confusing, and inefficient. Do they do some good things, and even some great things? Probably so, but that misses the point. Overall the organization is in turmoil (see recent leadership turnover) and lacks focus. Major restructuring is necessary to stop the bleeding that has been going on for some time now. I like the fact that the task force is calling for a major renovation to NAMB. There are specifics in these recommendations that I still have questions about. There are some I would either like to see dropped and given totally to state conventions, or have state conventions get out of the business and leave it entirely to NAMB in order to avoid duplication. But the emphasis on church planting is rightly placed. That is where the resources for a "home" mission board need to go. The most discussed aspect of Component #2 is the recommendation to phase out cooperative agreements over a four-year period. NAMB currently sends back over $50 million to the state conventions for various projects and staff. Some have argued that the state conventions will be dramatically harmed by this elimination. Let's be honest here: The larger state conventions will feel the difference, but it will not be dramatic when considered in light of the size of these organizations. The smaller state conventions, those in pioneer areas, may actually be seriously harmed by a decrease in funding in this way. One of the points of emphasis of the task for is how we can better reach pioneer areas, so at this point I am giving the task force the benefit of the doubt that they have considered and will have some answers as to what will happen to replace this revenue stream to the smaller state conventions. There is no doubt in my mind a better system can be invented and implemented than the current system. In reality, the 14 largest state conventions (represented in blue on the map to the left) do not need money returned to them. They are large enough to support themselves completely and should be called on to do so. It is exciting to think of the possibilities of a reinvented North American Mission Board. I think the task force's recommendations could still use some tweaking here and there, but overall the vision cast in Component #2 is sorely needed and a breath of fresh air for those of us who want efficiency with our resources and deep impact on our continent for the gospel. 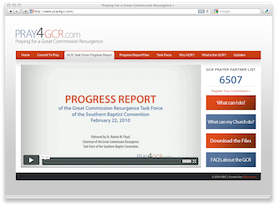 The Great Commission Resurgence Task Force released a progress report back on February 22, 2010. They have made clear this is not the final report, that some changes and adjustments will be made. The final report is scheduled to be released a little more than a week from now, so some of what I write in this series may become obsolete pretty quickly. But I still think its worth walking through the six components of the progress report and examining each one. I write as someone who has been supportive of the GCR movement from the beginning. I voted last year (along with around 95% of messengers) for the task force to be named by Johnny Hunt. I was pleased, for the most part, with those chosen to be on the task force, especially after a few were added. After seeing the progress report, I am still supportive of the movement. All that's just to let you know the perspective I'm coming from. Even though there has been relatively little discussion of it so far, it's difficult to underestimate the importance of Component #1. This is foundational to the other components. It's in many ways, I believe, a summary statement of what the rest of the components seek to accomplish. We believe in order for us to work together more faithfully and effectively towards the fulfillment of the Great Commission, we will ask Southern Baptists to rally towards a clear and compelling missional vision and begin to conduct ourselves with core values that will create a new and healthy culture within the Southern Baptist Convention. There are two aspects that deserve highlighting: First, a missional vision, and second, a new and healthy culture described by eight core values. Component #1 calls Southern Baptists to a "clear and compelling missional vision." Some might point out that using the words 'clear' and 'missional' together is a little ironic since it might be hard to define 'missional' with any kind of clarity in the first place. It's a word that's been used by people in different ways and with a wide range of intended meanings behind it. So what does 'missional' mean and what does the task force mean by it? Missional means, in my understanding, being wrapped up in the mission of God as a lifestyle. In other words we see the Great Commission, the spread of the gospel of God's reconciling sinners through faith alone in Christ, as the job of every Christian, not just the jobs of pastors and missionaries. It means we see our own places (towns, cities, workplaces, families, etc...) as mission fields. We have no home field. Everywhere we go is an away game. You look at your life and every day as a mission trip whether you're on another continent or living in the same community where you were raised. So for Southern Baptists to have a missional vision is for us to see ourselves as missionaries and the places we go daily as mission fields. This is emphatically not to the exclusion or to diminish those full-time, vocational missionaries we send various places. In fact, we we understand 'missional' correctly, we are going to see the importance of missions all the more. But there's a shift from the us (non-missionaries) and them (missionaries) mentality to a way of thinking that says we're all on the same team, working toward the same goal, only in different locations. 'Missional' is a newer term and therefore its definition is still somewhat fuzzy to many Southern Baptists. And its also been misused at times by people who do not have the gospel as the focus of their message to the world. But these shouldn't keep us from rallying around this concept. Can you imagine what the SBC would look like if our people and churches grasped this vision? It's staggering to imagine the impact we could have. Al Mohler reminded us recently that we have a reputation and tendency to be grumpy. Some might say it's easier to define Southern Baptists by what we're against than what we're for. We could point out examples of where our interaction with each other is filled more with sarcasm and cynicism than love and trust. Our Southern Baptist culture, in many areas, is not a healthy example of how Jesus' disciples should act toward one another. The eight core values we should operate with are, according to the task force: Christ-likeness, truth, unity, relationships, trust, future, local church, and kingdom. When we are at our best, these items describe us well. But until these qualities begin to describe the norm instead of the ideal, we will rightfully keep our reputation as a grumpy, disagreeable group. The Bible tells us that we should live at peace with everyone, so long as it depends on us. Too often we look like we're ready to pick a fight with anyone available. Mark Driscoll, Disney, calvinists, Ed Stetzer, Barak Obama, private-prayer language practicers, bloggers, anyone who's not 'Baptist enough', Rick Warren, etc... When it comes to other believers, when will Southern Baptists emphasize what we have in common more than what separates us? Can't we rejoice loudly at how many lives Rick Warren has touched with the gospel and have some quiet, private discussions if we wish he used a different methodology? I'm thankful for the task force for calling us to put aside abrasiveness for a new, healthier culture. 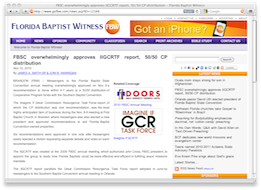 If you want to hear the task force report on Component #1, watch the video at http://www.pray4gcr.com/ between 26:08 and 31:30. You can also download the audio file of the report here. A lot of discussion about the GCR Task Force's Interim report. My plan is to jump in the discussion with several posts examining each of the 6 components. This will lead up to the May 3rd release of the final report by the task force. Les Puryear is launching an initiative to have more small church pastors elected and appointed to leadership positions in the SBC. He's explained what difference he thinks it will make. I'm not opposed to having more small church types in leadership, I just don't think the problem is as pressing as he thinks it is, and I don't think it will help solve the issues to any real extent. Besides, we have more important issues to deal with right now. Ergun Caner has a lot of splainin' to do about some inconsistent statements he's made about his past. Even some questions about whether or not he even knows Arabic like he claims (Youtube video of him speaking some gibberish, passing it off as Arabic). No such explanation seems to be forthcoming, at least not yet. We should expect better from someone who's president of Liberty University's Theological Seminary. Baptist21 has announced the details of their lunch and panel discussion on Tuesday of this year's SBC Annual Meeting. Sarah and I attended last year and it was a highlight of our trip. You can see the details and reserve a spot here. If you'll be in Orlando, don't miss it.